Advertised as "the most powerful premium compact model in Aquos history", this is the first smartphone for the Japanese market to utilise Sharp's free-form displays (that were showcased as early as mid-2014), beaten by at least three months by the Chinese division, fully managed by Foxconn, which released the Aquos S2 in August. But while the Aquos S2 uses a conventional LCD, the Aquos R Compact has an IGZO display. This is not, however, the latest in-cell IGZO as found on the Aquos R and earlier devices. The Aquos R compact's most conspicuous feature is, of course, its three-side super-narrow-bezel design. The 4.9-inch high-speed IGZO display is fitted in a very compact body whose width is just 66 mm. This is possible thanks to the adoption of the new trend in smartphone design where displays now have a 18:9 ratio instead of the 16:9 that reigned until last year. The display on the Aquos R compact has a resolution of 2032 x 1080 pixels, with the 112-pixel extra bit cut-out in the middle to accommodate the inner camera, and rounded top corners – something that is only possible with the free-form display technology. The new design is dubbed EDGEST Fit and has dealt away with the "drawbacks" of the predecessor EDGEST series that had a difficult-to-hold angular design and bottom-bezel placement of the inner camera. I've put "drawbacks" in quotes as I have personally never felt them as such. Like the previous flagship models, this one also comes with a high-speed IGZO screen with a 120 Hz refresh rate for smooth scrolling without blurring text and images and crisp high-speed movement video and games. To combat eye-fatigue, you can revert to the standard 60 Hz and also reduce the blue light – something that Sharp have offered for at least two years now, although Apple bragged it as "unique" in their latest iPhone X. Image quality is further enhanced by the S-Pure LED back-lighting technology employed on all recent Sharp flagship models. The colour gamut covered by the Aquos R compact display is 90% of the digital cinema standard (DCI-P3) – the Rich Color Technology Mobile. Since this is a compact version of the Aquos R, it ships with 3 GB of RAM and with 32 GB storage (4 GB and 64 GB respectively in the Aquos R). The processor is Qualcomm's latest mid-range – the Snapdragon 660 that has eight 64-bit "Kryo 260" CPU cores with 2.2G Hz maximum speed and the Adreno 512 graphics unit to handle visuals. This is the same processor found on the higher-class FS8016 Aquos S2. This processor supports 4K video capture and playback, Quick Charge 3.0, the latest standards for Wi-Fi and Bluetooth connectivity, and LTE Category 13 uplink (150 Mbps) / Cat 12 downlink (600 Mbps). Operation speed should be faster in comparison with previous models, despite the mid-range Snapdragon 660 and the 3 GB of RAM, thanks to utilising the latest in double data rate synchronous DRAM (the LPDDR4X standard) for improved energy saving and higher data transfer rates. The same type of RAM is found on the Chinese Aquos S2. The main camera is 16.4 megapixels, wide lens (90°) with high-speed auto-focus. Further details to follow but we should expect the improvements found on the Aquos R. The concept video flaunts an interesting new feature of the inner camera called Eye Catch Selfy for capturing the best eye position of the subject. 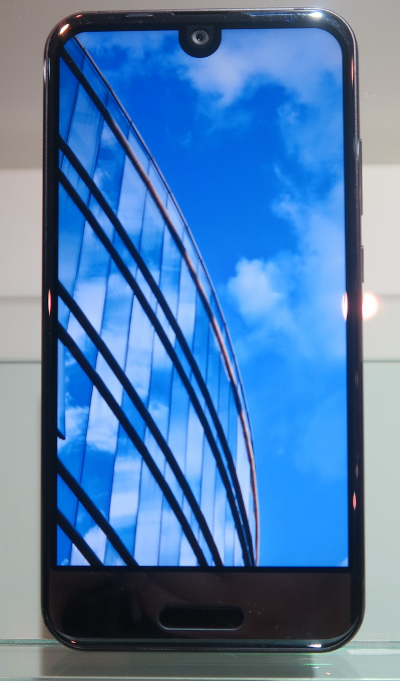 The front camera itself is 8 MP, wide-angle (90°), and can record full HD videos. The Aquos R compact is equipped with USB Power Delivery (USB-PD) Type-C port for very fast charging of up to 5 A. This is coupled with a new charge-control technology to extend battery life, with Sharp engineers promising that the battery will maintain 90% of its initial capacity after 12 months, even with rapid charging. The battery capacity is 2500 mAh. On the top, a 3.5-mm audio jack is mounted. The bottom bezel is quite big and houses the fingerprint scanner, which can also function as a Home button (the onscreen navigation buttons disappear if set). 3G (W-CDMA): 800 MHz (Band VI/XIX), 900 MHz (Band VIII), 1.5 GHz (Band 11), 1.7 GHz (Band IX), 2.0 GHz (Band I). Further connectivity options include Bluetooth 5.0 and Wi-Fi a/b/g/n/ac (dual-band 2.4/5 GHz). GPS/GLONASS positioning and NFC/Felica for mobile payments are also included. Only OneSeg digital TV is supported. The phone is, as usual, waterproof (IPX5/IPX8) and dustproof (IP6X). 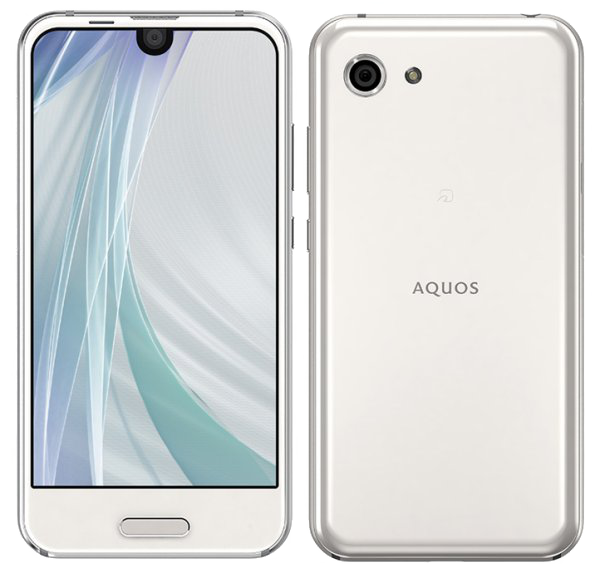 The Aquos R compact is the first Sharp phone to ship with Android Oreo (8.0) with the company promising at least two major upgrades in the future. The Aquos R compact measures 132 x 66 x 9.6 mm and weighs 140 grams. The AU version of the Aquos R compact, the SHV41, is offered in metal black, rose pink, and moon white.